When it comes to your family's safety, why take ... chances? Conventional outdrive might cause you costly damage to the rotating external propellers. While conventional propellers disperse water in a wide pattern, generating less forward motion, the Direct Drive Jet Propulsion system concentrates it into a super powerful water stream. As a result your boat is explosively accelerated and enjoys superb manoeuvrability. This means unmatched responsiveness, both when accelerating and maneuvering. You truly feel connected to your water experience. There are many reasons why Yamaha jet-boats lead their class in sales. Today’s boaters demand more, and Yamaha owners have learned first hand that they can achieve that perfect balance of fuel efficiency and family fun on their Yamaha jet-boat. 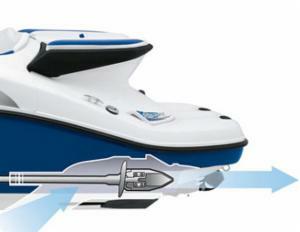 Yamaha’s internal jet propulsion system delivers explosive acceleration and reduces bow rise. When the jet-boat pushes forward, the higher thrust point of our boats allows them to plane more quickly than stern-driven boats. Twin internal four-stroke Yamaha Marine jet-engines offer incomparable handling and allow Yamaha jet-boats to accelerate twice as fast as competitive stern-driven boats – going from 0-30 in half the time, while using two fewer gallons of fuel per hour. With Yamaha's internal propulsion and compact engine design, innovative swim platform rests at the water level, allowing you and your family to get in and out of the water with ease.